Our ‘Reviews’ page(s) feature full-length reviews of new recordings and archive material which are considered editorially to be ‘required listening’, falling either into four or five-star categories or of a highly recommended/listen-and-decide-for-yourself nature. Find these by clicking on the header or in the lead box above. Remembering those in the soul (and associated crossover jazz and blues) genre who have passed over the last six months or so. Up-to-date lists of cds, vinyl lps, 45s, and books & magazines for sale, plus details of how to purchase. Links to our friends on the web and information on how to contact us. 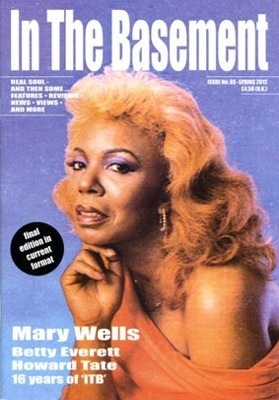 the Soul Basement website is the successor to ‘In The Basement’ magazine. Pictured left is the final issue of ‘In The Basement’ in tangible format - #65, Spring 2012 - 80 pages packed, as ever, with artist features, news, reviews, gig reports, obituaries and much, much more. A very limited number of copies of this and certain other back issues are still available. For details of contents and how to purchase, please click here.